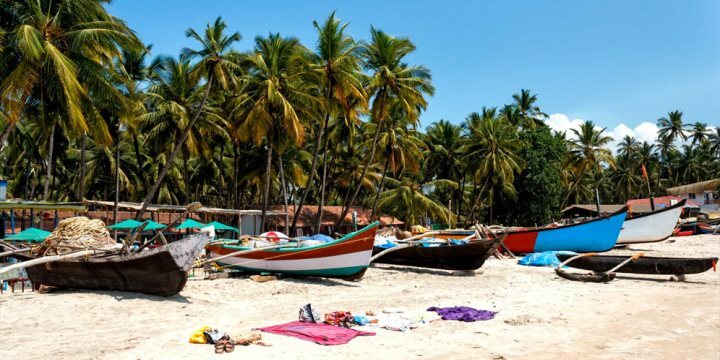 From glorious, sandy beaches to interesting historical sites, this tour of South Goa will allow visitors to become familiar with some of the state’s most fascinating sites. After a morning collection from your hotel, you'll arrive on the gorgeous shores of Agonda Beach, home to a long, palm-fringed strip of sand, perfect to relax upon as the morning sun intensifies. If you fancy a break from lazing on the sand or splashing around in the sea, the beach is known for its turtle centre which is home to a number of Olive Ridley Turtle eggs currently under protection. Once your slumber on the sand is over, you’ll be guided to the Cabo De Rama Fort, an ancient fortress peering out over the Arabian Sea and recognised as one of the oldest forts in Goa. The Portuguese once equipped it with 21 guns and military barracks, and today a few rusty cannons provide a window to the fort’s past exploits. After this step back in time, your tour will continue with a drive to Palolem Beach, one of the most picturesque coastal locations in the state. Your time here will begin with a delicious buffet lunch (payable locally), before hitting the beach for a relax and a swim, completing your tour of some of the highlights of South Goa.